Ok, social media report guys. Almost a year to the day SSD entered to world of Instagram. Aaron Pucko’s WR Green Jobfish was chosen as the ice breaker. 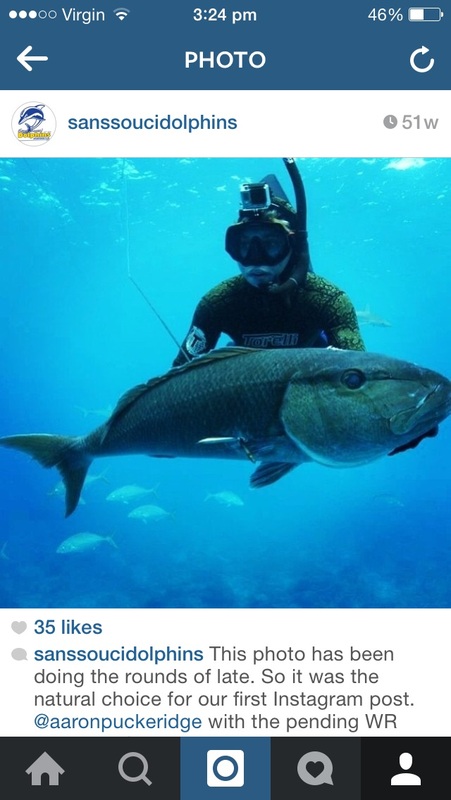 This fish received 35 ‘likes’ but helped boost the SSD account into (possibly) the greatest of the Insta World. 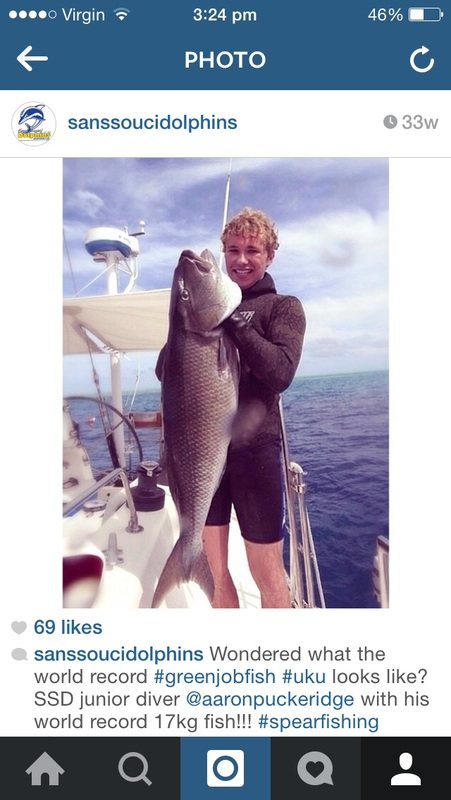 It was an underwater pic, had I chosen the other version, with Aaron’s curly blonde locks, on a fancy Yacht, with dreamy blue water in the background it may have received more attention. In fact, it did. This pic I speak of was posted some time later and received over 60 ‘likes’, thus proving my theory correct ( this had nothing to do with the fact the account had grown substantially). 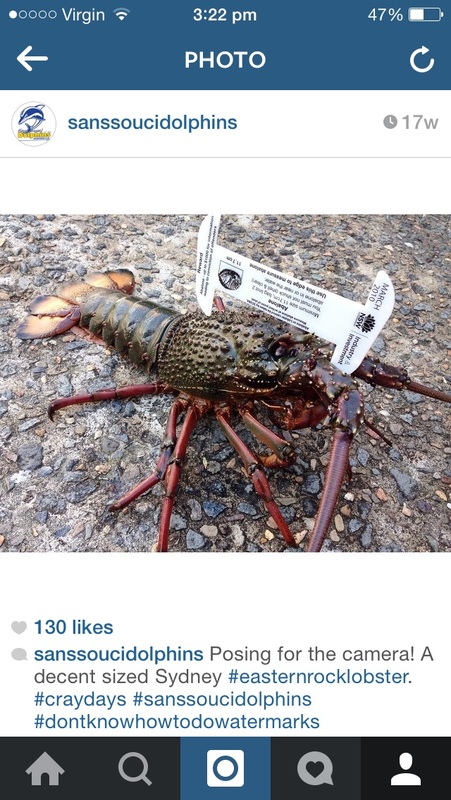 The most ‘liked’ pic was that of a nice Eastern Rock Lobster with 130. Ironically, this was posted during the time Trippey was giving the social media world hell on their ‘watermarking’ of photos. The accompanying hash tag #dontknowhowtodowatermarks just may have catapulted this pic onto the podium and its first place finish. Some numbskull felt it necessary to tell us “pretty sure you don’t measure like that”. Guess what C%&TFACE, it is. 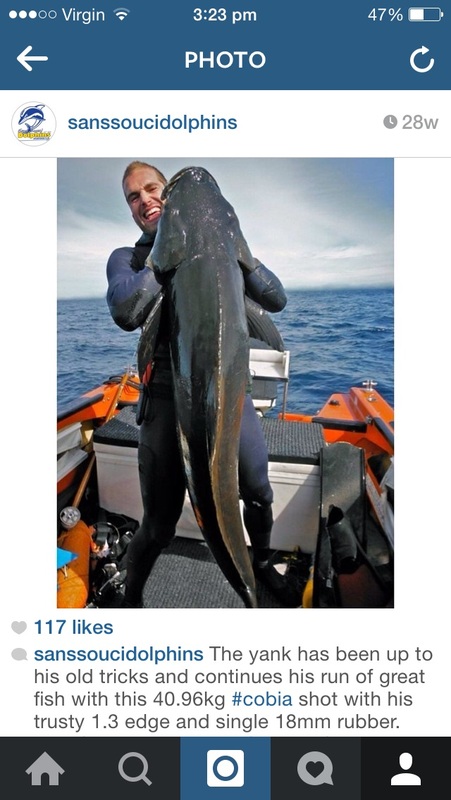 Furthermore, following closely behind in second place was cracking shot of Evan’s 40kg Cobia. This pic captured the attention of many, including a lovely comment from Dan Galea that read, “cracking fish”. However, it also captured the attention of some unsavoury characters such as @j_james_coughtrie who responded “filthy brown log”. I thought this particularly funny as those of us unfortunate enough to have Evan on Snapchat receive daily video’s of his ‘filthy brown logs’. Some other punters recognised Evan and proclaimed “these are the lads we met at the burger shop”. We sure are boys, we sure are. In third place and just scraping onto the podium was another pic of Evan. A lovely 28kg Spanish Mackerel. 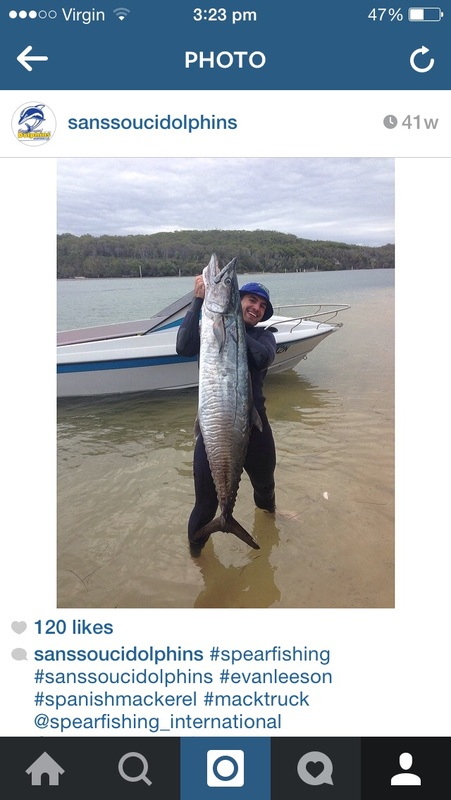 This fish received 120 ‘likes’. There weren’t any funny comments on this post, in fact they were all very pleasant. Evan looked particularly handsome also. In the ensuing statistical analysis of the demographic that engaged this post it was found that 98% of the likes were from females ‘over 50’. The remaining 2% were from men in Evans circle of friends . Marshy also liked it, but the Jury is still out on that one. Well stuff me, it seems that I have missed a post. Disregard the above as the REAL FIRST PLACE pic is that of longtime friend and corrupter of the club, Mr John Brown. 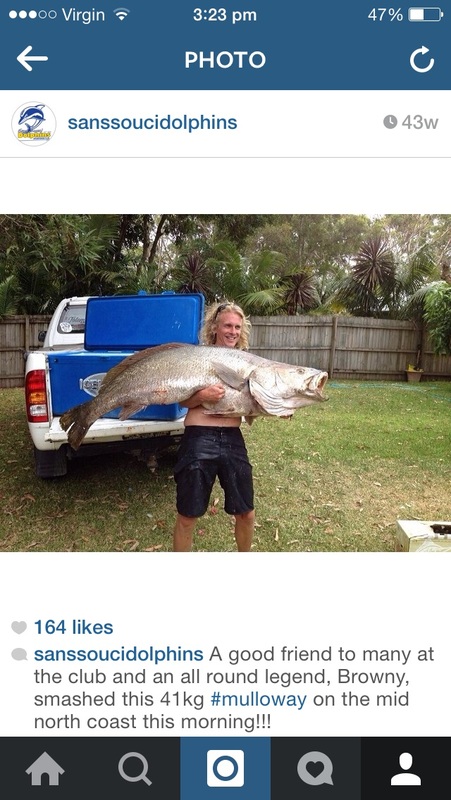 No surprises, but his whopping 41kg Mulloway received an astonishing 164 ‘likes’ and a cloud of Marijuana smoke. Delpopolo was no where to be seen. Lots of comments for this one folks, such as ‘horse fish, and ‘donkey’. I don’t know why fish are referred to as land animals but I guess it’s fine. Other comments included ‘nice soapy mate’, ‘nup, this is fucked’ and aptly put ‘muthafuckan Jewy King’. Well done Browny! Thank you to everyone who sent in pics throughout the year, I think Instagram really put SSD on the social media map and generated a lot of interest in the club. This was apparent by how many times I had to tell everyone that meetings are held on the 3rd Tuesday of the month, at South Sydney Amateur Fishing Association Club House, on the corner of Hastings Ave and Macquarie Street, Chifley, Sydney, NSW, Australia at 7:30pm. Despite this knowledge, I was always asking when they were, hey Simon, Derrick and Evan? I’m not sure if this fits the structure of an annual report but it sure was fun writing it.